Yorkshire's Alex Lees hits out. ALEX LEES is adamant that Yorkshire can challenge for silverware after being confirmed as the club’s new one-day captain. Lees’s appointment has been rubber-stamped after a spell as interim leader last summer. The 22-year-old opening batsman – the club’s youngest official limited-overs captain – took the reins after club captain Andrew Gale relinquished the one-day leadership in August. Lees guided Yorkshire to the semi-finals of the Royal London Cup and is now confident they can arrest a record which has seen them go 13 years without a one-day trophy. “It gives me great pride to be leading Yorkshire in one-day cricket,” said Lees, who hails from Halifax. “This is a big county with lots of potential and opportunity. It is an exciting time to be part of a team that has high hopes of trying to win some silverware in white-ball cricket. “I’m only 22, but I have a lot to offer as captain. I will be very open with my approach and will lean on the experienced players to drive us on and be successful. 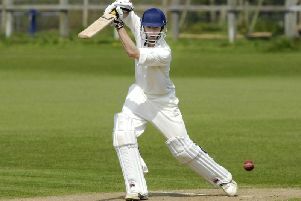 Lees, who has made 31 List A and 21 T20 appearances, is highly regarded by the Yorkshire hierarchy. They view him as a wise head on young shoulders and someone around whom a successful strategy can be built. Jason Gillespie, the Yorkshire first-team coach, said that although the club had considered several options, they had no hesitation in plumping for Lees. “Alex captained the side in a number of fixtures in the 50-over and T20 competitions last season and we thought he did a pretty good job,” said Gillespie. “After considering a number of candidates, we feel Alex is the right fit for us as captain. “He learned a lot on the job last season and we think he can develop as a leader further. Lees led Yorkshire 10 times in all cricket last season. He captained them to a nine-wicket victory in the opening match of the first-class campaign, against MCC in Abu Dhabi, when Gale was serving a ban for comments made to Lancashire batsman Ashwell Prince during a game at Old Trafford the previous August. With Gale still banned, Lees also led Yorkshire to a 10-wicket win in their opening County Championship match against Worcestershire at New Road, a result to which he contributed strongly. Lees top-scored with 87 in the Yorkshire first innings and with an unbeaten 52 in the second innings. After scoring an even 100 in the next Championship fixture, against Nottinghamshire at Trent Bridge, Lees’s form tailed off in the way it is prone to do with young players. He went 23 innings in all cricket without a half-century before an unbeaten 58 helped Yorkshire to a seven-wicket win over Worcestershire in the Championship at Scarborough. Lees followed up with 63 in his next outing, when he led Yorkshire to an eight-wicket victory over Warwickshire in the T20 Blast at Headingley, and with 67 in his next game as captain in a 133-run pummelling of Worcestershire at New Road in the Royal London Cup. Lees went on to score 75 in leading Yorkshire to a 31-run win over Leicestershire in the Royal London Cup at Headingley, and he ended the English season with 1,334 runs in all cricket at an average of 29.64. As captain, however, that average climbed to 49.12, suggesting that increased responsibility brings out the best in him. Lees also prospered with the bat on the previous occasion he led Yorkshire prior to last season, against Sri Lanka A at Headingley in 2014. Lees top-scored with 54 on that occasion during a summer in which he made 1,868 runs in all cricket at 45.56, a performance which earned him a place on the England Lions tour of South Africa. Lees has played 12 times for the Lions since 2013 and is well thought of by England, who feel he can challenge strongly for a batting berth in years to come.